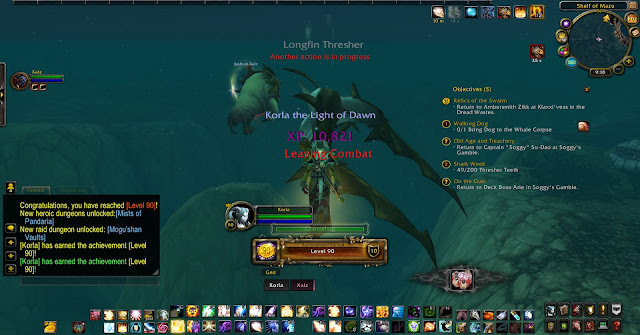 Vault of Light: Level 90 and Pandaria so far. 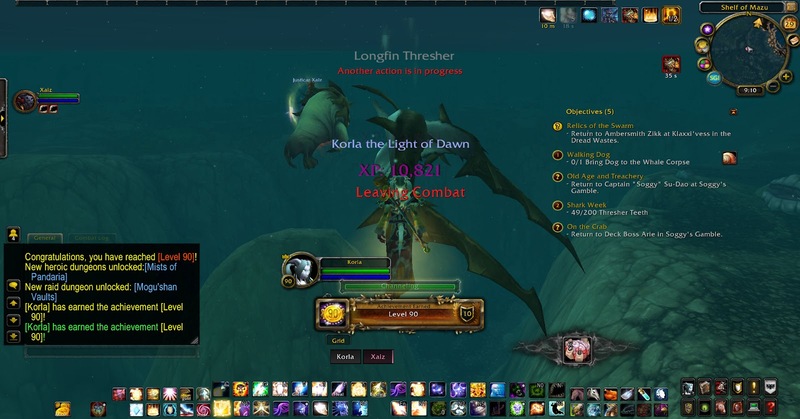 Level 90 and Pandaria so far. Last night I hit level 90! It went faster than expected. I leveled with my boyfriend and we just took it really slow, taking breaks from time to time to play Pet Battles or level professions. I think it's the most fun I've had leveling at the start of an expansion so far. The night of release was crazy. Being on a super high population server meant that there were people everywhere, the lag was insane and the game was basically unplayable. I still don't think people understand that to accept / hand in a quest you don't have to stand on top of the NPC especially not on your mount. We decided that since questing wasn't going to be an option to go explore and farm some crafting materials instead. I decided to skin and he went with mining. By the next day the majority of the crowd had either moved onto new zones or onto further quest hubs - don't get me wrong it was still chaos but just on a slightly less manic scale. Questing felt really engaging, I loved how much talking the NPC's did between both themselves and to the player. One nice change was with quests that give you an NPC which follows you. Each player gets their own NPC who's name displays differently to others. Meaning you see "John" everyone else sees an NPC with a generic name following you around while their own NPC displays "John". It was a really nice touch. Each of the zones feel different and fresh. I loved Jade Forest and Valley of the four winds. Many of the quest mobs weren't a simple 'hit it until it dies' mob, most of them had different mechanics making use of the extra button feature and spells which had to be interrupted or avoided. Profession's seem to be a bit on the easy side to level although acquiring the blue crafted patterns seems to be where the challenge is. The drop rate on Mote of Harmony seems lower than it should be, but it may just be a case of bad RNG. Cooking caused me a bit of confusion to begin with being that there was also limited information on WoWhead. The new instances are awesome! I haven't done any heroics yet but the normal versions are really fun. I feel pretty weak on my Priest at the moment but I'll have to do a little bit more testing to find out if it's just a gear issue for now. We didn't have any problems doing any of the instances regardless. I've done each of the new battlegrounds once Silvershard Mines was great fun. There are three carts which begin in the middle of the zone and begin moving towards their depot. They each have a circle around them and standing within the circle brings up a capturing bar (much like the towers in Eye of the Storm) Horde and Alliance players fight around the carts to control them. Once a cart reaches the depot another one spawns. The first team to reach 1600 points win. 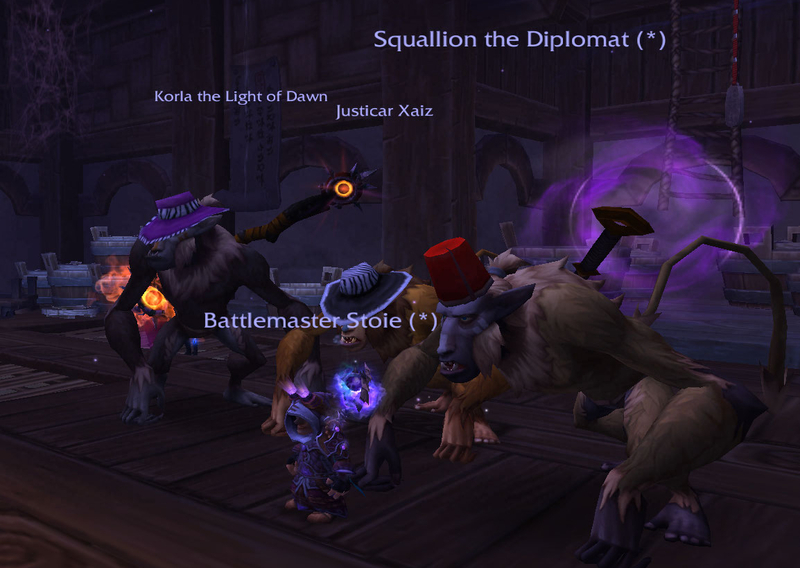 Temple of Kotmogu is CRAZY FUN! Four orbs spawn in the outer square of the battleground. Picking up an orb grants you the debuff "Orb of Power" which makes you take more damage, do more damage and receive less healing. While holding the orbs you gain points for your team. You get more points depending on where you stand with your orb. You get more points for standing in the middle but you're also more likely to get killed unless your team 'holds' the middle. It's a really fun game. As someone who isn't too into PvP I was surprised that I enjoyed this as much as I did I'm looking forward to doing a bit more in time. Pet Battles seem really fun although I've not spent a huge amount of time with them. I never played Pokemon ore any other kind of turn style game for that matter. My boyfriend seems to be going down some logical route whereas I'm going down the OMG THAT'S CUTE! route when it comes to selecting which pets to use. It's something I plan to look into a bit more later on in the expansion. Hitting level 90 felt a bit overwhelming there's sooooo much to do. Dailys, dailys, dailys and more dailys but don't forget to take a break. We're going to have this expansion for a little while so don't get yourself totally burned out within the first month or two! Blizzard did a great job with Mists of Pandaria and I'm loving it so far. How about you? What have been your highlights?